The slumping San Diego Gulls will get their third and final chance to get the one standings point they need to qualify for the Calder Cup playoffs Saturday evening when they play the Tucson Roadrunners in Tucson. A 3-2 loss to the Roadrunners Friday night in Tucson means that if the Gulls don’t win in regulation, overtime or a shootout, or lose in overtime or a shootout in their regular-season finale, the American Hockey League‘s final playoff berth will go to the winner of Saturday evening’s San Jose Barracuda-Stockton Heat game. The Gulls enter Saturday evening’s game with 76 points, two more than both San Jose and Stockton. With all types of victories worth two standings points, the Barracuda-Heat winner would match the Gulls with 76 points if the Gulls fail to get a standings point. The San Jose and Stockton both have the tiebreaker advantages over the Gulls. 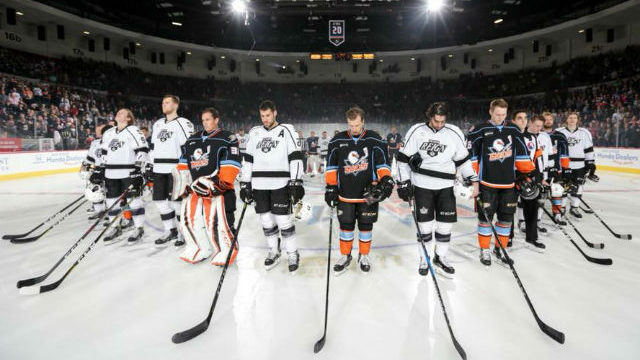 The Gulls qualified for the playoffs each of their first two seasons in the AHL. The Gulls were three minutes, 10 seconds away from getting their elusive 77th standings point Friday night, but Mario Kempe took a cross-ice pass from Kyle Capobianco and put a shot from the right faceoff circle past Kevin Boyle for his second goal of the game and 18th of the season. “We have three chances to get the puck out, and we try to clear it up the middle which we’ve been taught from a very early age to put that puck to the wall and we had a couple players panic there and it ends up in your net,” Gulls coach Dallas Eakins said. “Our shifts got a little long there, we got caught with five guys on the ice that were tired and they capitalized,” said Megna, who was not on the ice for the winning goal. The loss was the fifth in six games and sixth in their last eight for the Gulls (36-27-3-1), the Anaheim Ducks AHL affiliate. The Gulls tied the score twice, but never took the lead in their second loss in three nights to the Roadrunners, the Arizona Coyotes AHL affiliate. The Gulls tied the score for the second time when Kevin Roy put a wrist shot from the point past Adin Hill with 12.9 seconds remaining in the second period. Megna and Corey Tropp were credited with assists. Tucson (41-20-5-1) had regained the lead on Kempe’s power-play goal with 2:04 left in the second period. Roadrunners defenseman Dysin Mayo opened the scoring 6:28 into the first period on a wrist shot before a crowd at Tucson Convention Center Arena announced at 4,311. The Gulls league-leading power play scored on its only opportunity with Nic Kerdiles lifting a shot over Hill’s glove at 14:04 of the first period. The Gulls were outshot, 28-26, including a 10-6 disadvantage in the third period. Hill (19-11-4-0) made 24 saves, two nights after his 36-save shutout of the Gulls. Boyle (19-13-1-1) made 25 saves.